After the artistic disappointment of 1981's For Those About To Rock We Salute You, AC/DC regroup, strip down and come back with half of a very good album. Flick Of The Switch is a conscious return to basics, more focussed and scaled down. With everything stripped down including the rudimentary cover art, the album features some stellar achievements, but is let down by a relatively uninspired second half. Without straying too far from the band's roots of rock'n'roll infused with the raw power of steel, three of the first four tracks would hold their own in any AC/DC greatest hits collection. Opener Rising Power is a statement of muscular intent, an invincible riff supporting Brian Johnson at his snarly best. 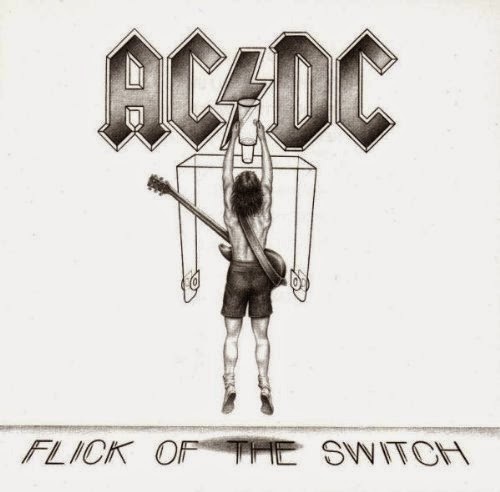 Title track Flick Of The Switch is just as perfect, Angus Young conjuring up a delicious twang to his guitar, the hook creating fist-pumping anarchy. Nervous Shakedown slows down the pace and increases the threat, a simple groove leading to thoroughly anguished vocals. The back end of the album cannot keep up and settles for AC/DC in least-effort mode, repetitive tracks that may play well live but add nothing to the band's repertoire. There is nothing fundamentally wrong with selections like Guns For Hire and Deep In The Hole; they are just easy and routine. Landslide and Bedlam In Belgium descend towards simplistic and lazy. AC/DC do flick the switch, but only about halfway. Engineered and Mixed by Tony Platt.